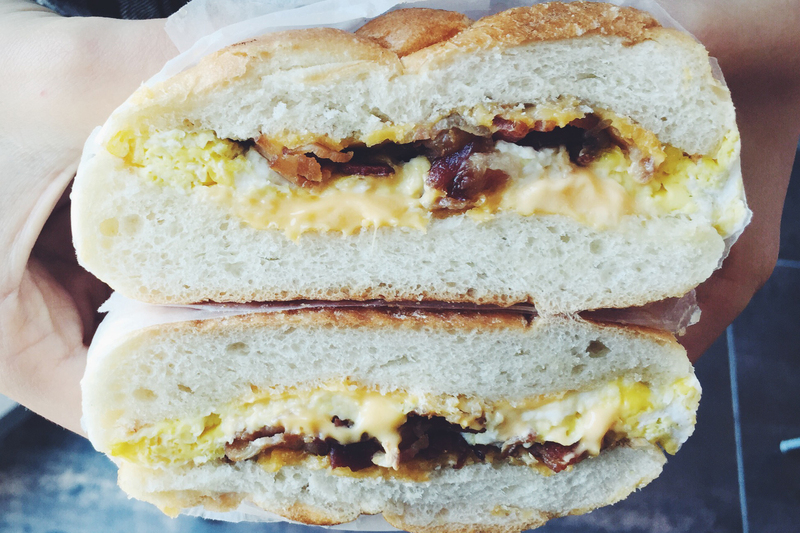 There’s more to New York’s best breakfast sandwiches than a mere bacon egg and cheese. 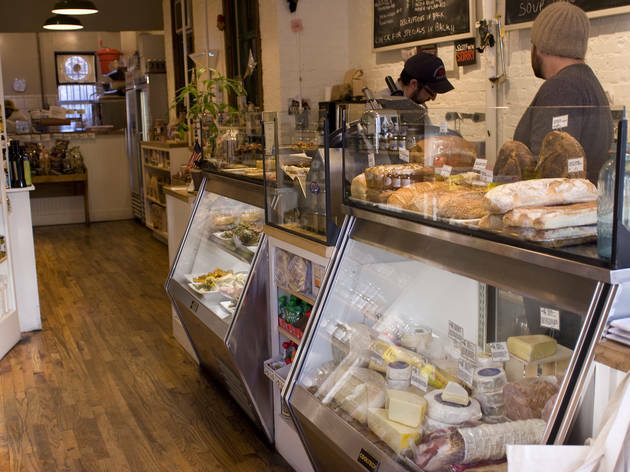 Doled out at the city’s best coffee shops, New York delis and all-day restaurants, these morning sammies range from smoked salmon piled on bagels to Italian porchetta on fresh-baked bread. 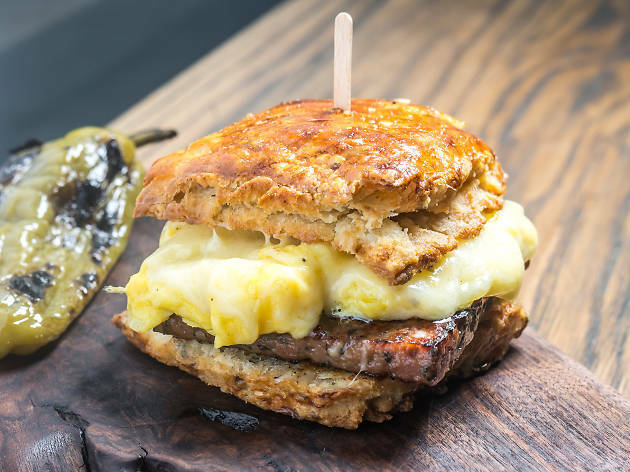 At some restaurants, bread is an afterthought—baskets of chalky, uninspired dinner rolls shuffled out with chilled, foil-wrapped butter. Here, it's the meal. Pillowy potato rolls come slathered with plucky gherkin mayo and padded with thick slices of bologna, Amish cheddar and fried red onions (Hickory Town sandwich). 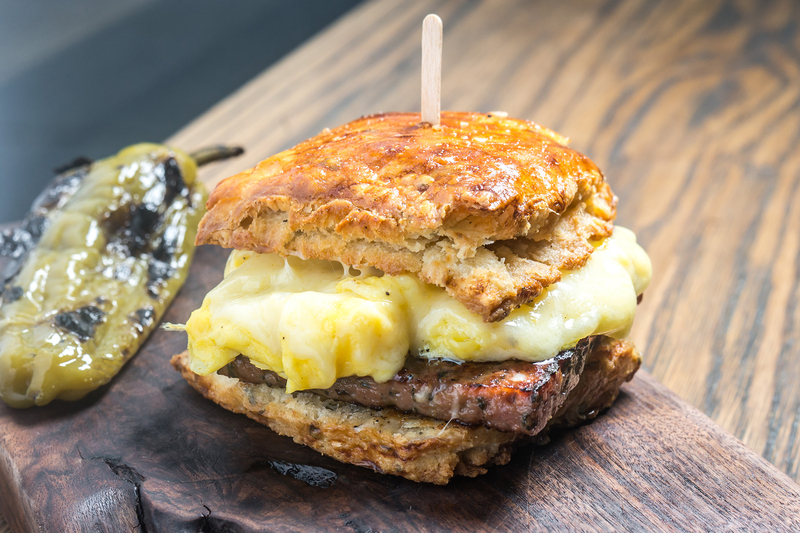 Buttery biscuits popping with pepper and sage hugs a soft egg, sausage and melty aged cheddar (breakfast sandwich). 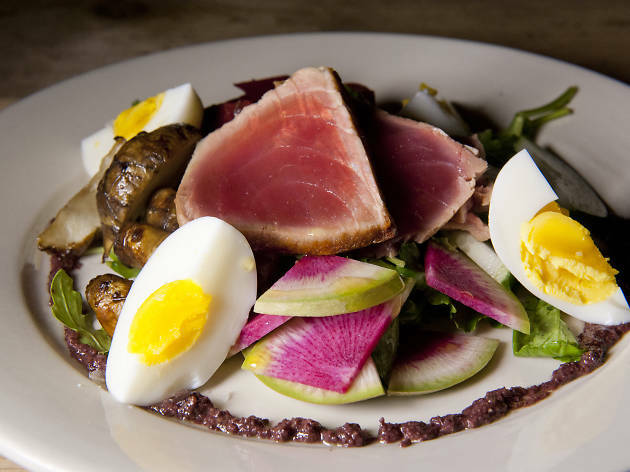 Contrary to what the name might suggest, Sunday in Brooklyn is open for brunch and dinner every day of the week. 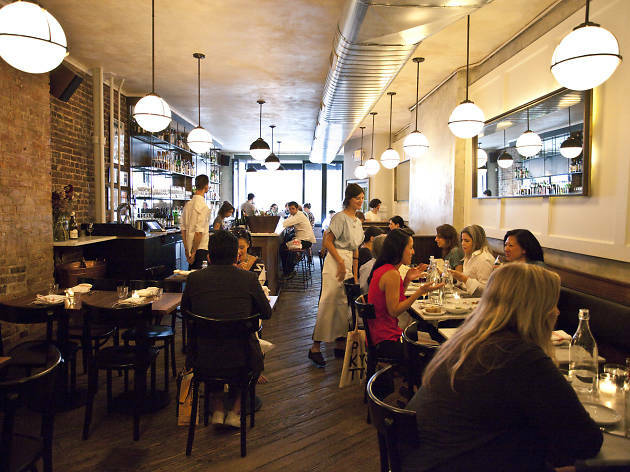 The rustic three-story space boasts an outdoor patio, marketplace, private dining room and rooftop garden. 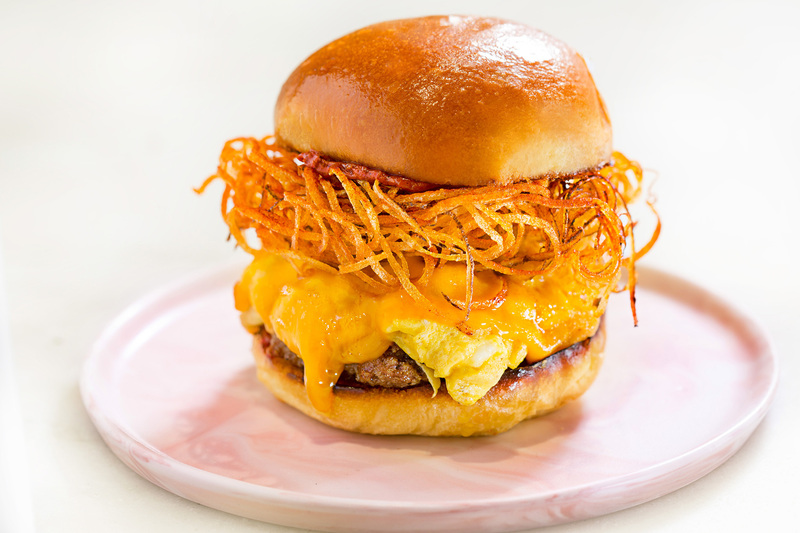 The brunch menu includes heavenly breakfast sandwiches like egg, sausage and gochujang aioli or spicy cauliflower with Swiss cheese and sauerkraut. 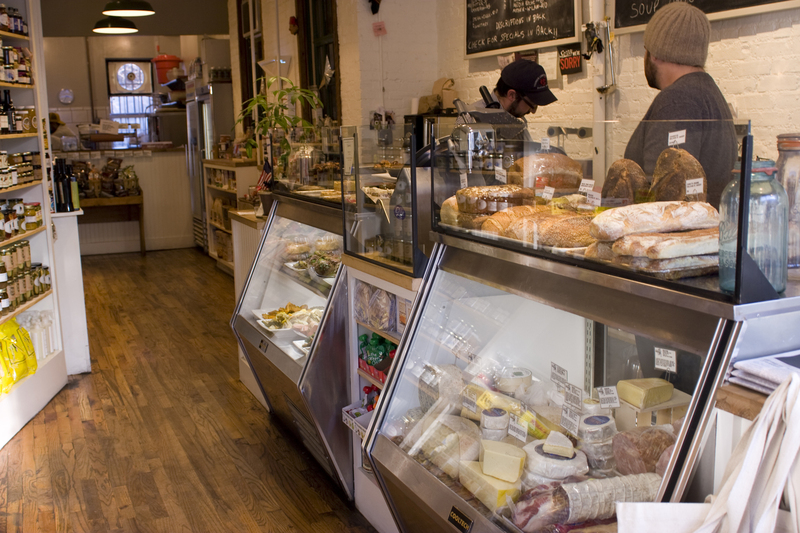 When Ben Jones’s Park Slope coffeeshop reopened in September 2016 following renovations, it brought on new partner and sandwich connoisseur Josh Sobel (Mile End, Court Street Grocers), who added a slew of sammies to the café’s breakfast lineup. For the namesake sandwich, Sobel jumpstarts the classic scrambled-egg sandwich with Heritage Meats ham, aged Cabot cheddar, pickled red onion and finger-licking red eye-style sauce that you’ll crave. 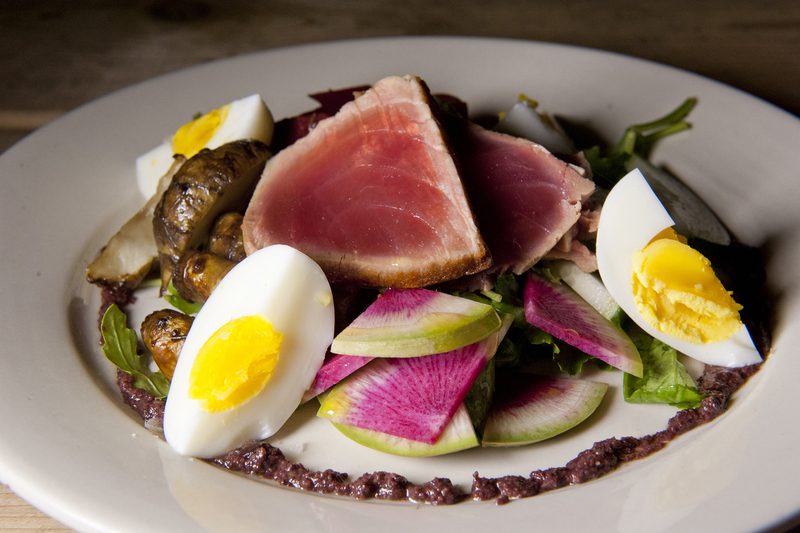 New York’s lox-and-schmear field is crowded. 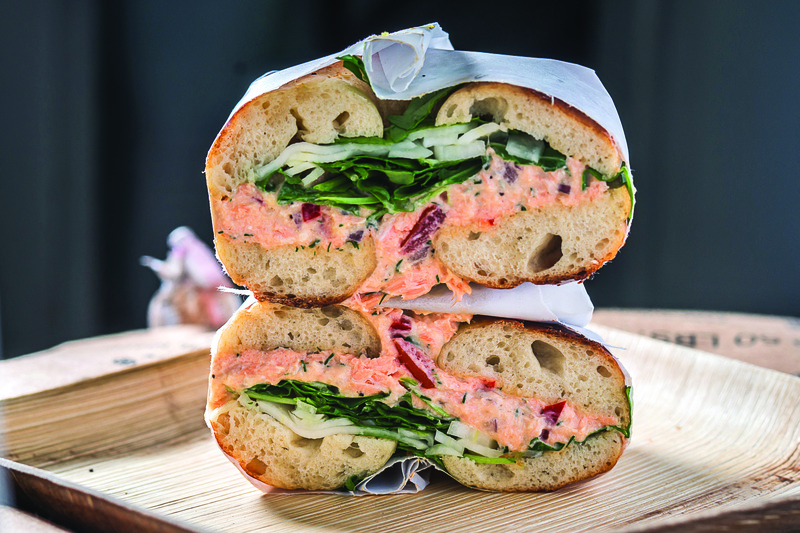 Not to be outdone, Noah Bernamoff and Matt Kliegman—the brains behind those cult-inducing Manhattan-meets-Montreal bagels roll out honey-boiled rounds topped with Black Seed standbys (tobiko cream cheese, beet lox), as well as exclusive new sandwiches like smoked salmon bookended with arugula, crème fraîche and a fried-caper omelette. 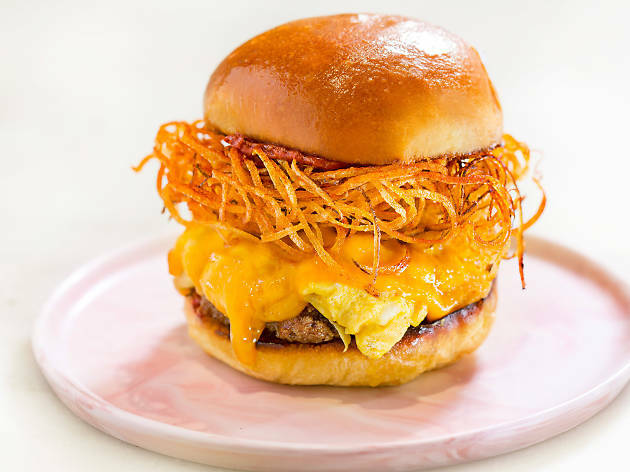 Capitalizing on the versatility of eggs, this breakfast-minded shop fries, scrambles, poaches and pickles its organic, locally sourced main ingredient to anchor bowls and to top sandwiches. 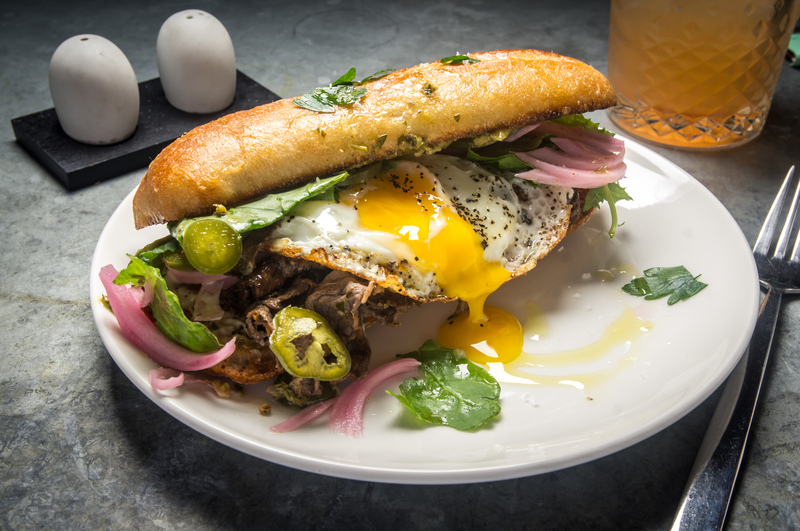 Of the latter, find an advanced take on steak and eggs: Grass-fed tenderloin is crammed with chimichurri, caramelized onion aioli, farm green, fresh pickled jalapeno and a sunny-side-up egg inside a French hero. 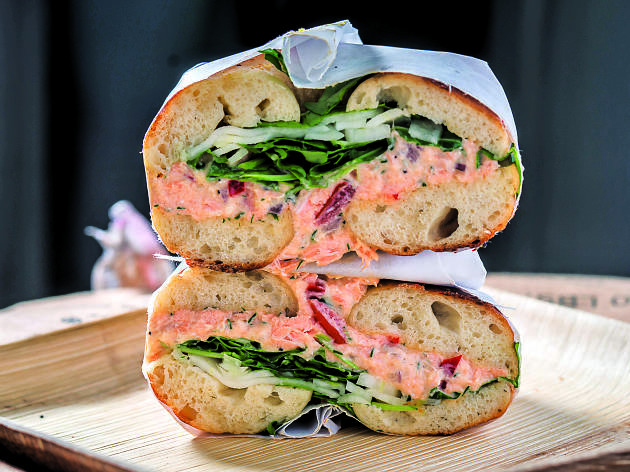 There are plenty of healthy, colorful toasts on offer at this SoCal-inspired café—rhubarb compote with dragon fruit, housemade tahini with rasbperries and honey—but for a heartier morning meal, look to the house breakfast sandwich: Scrambled eggs are layered with sliced avocado, cheddar and pickled jalapenos, and doused with plenty of hot sauce. Now that should wake you up. 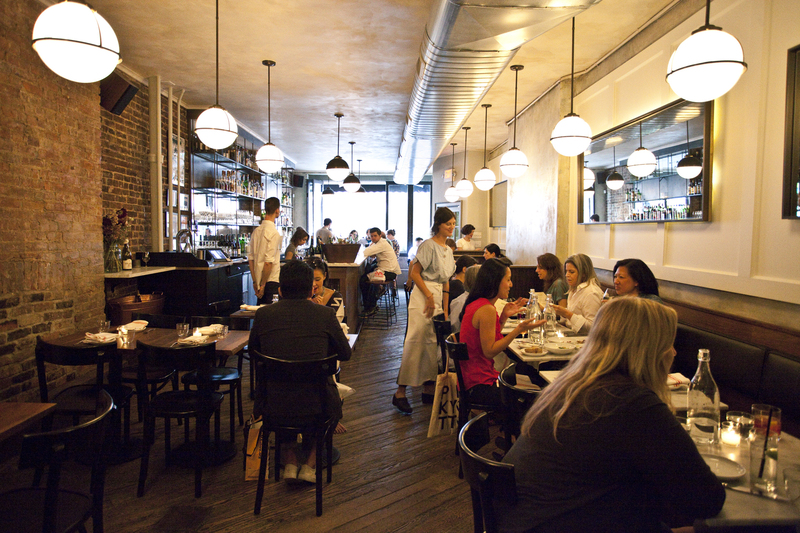 Ignacio Mattos has reined in his modernist tendencies at Estela, with an ever-changing, mostly small-plates menu that pivots from avant-garde toward intimate. 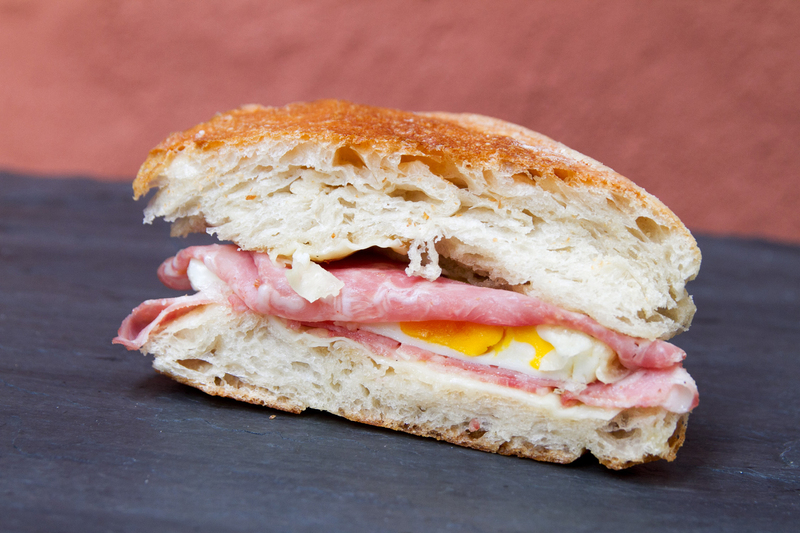 You can this at play with the chef's high-brow breakfast sandwich, which features salty pancetta, creamy avocado and a sunny-side-up egg tucked inside one of Bien Cuit's beautiful tebirke pastries. 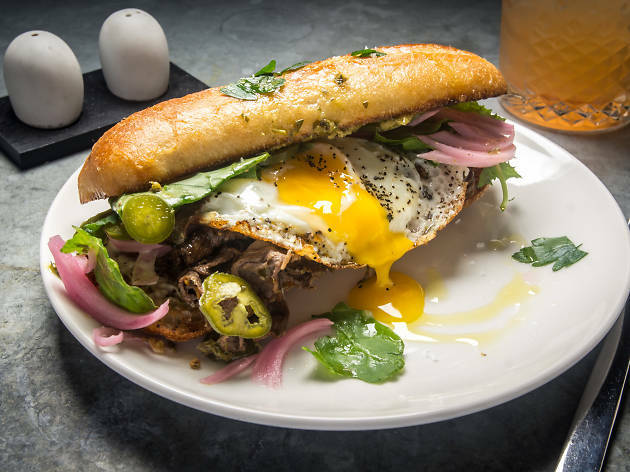 At this restaurant-market hybrid, you can stock your larder or settle into the 19-seat dining room for dressed-up versions of classic sandwiches. 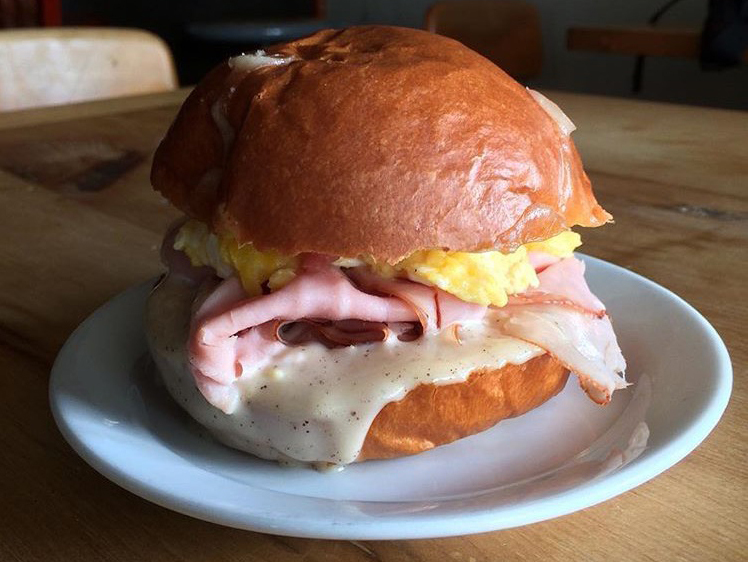 You can go the refined bodega route with the house breakfast sandwich (soft-scrambled eggs, cheddar cheese and arugula on a Balthazar ciabatta) or do as the Jerseyans do with a pork roll, featuring scrambled eggs, American cheese and Taylor ham on a Martin's potato roll. 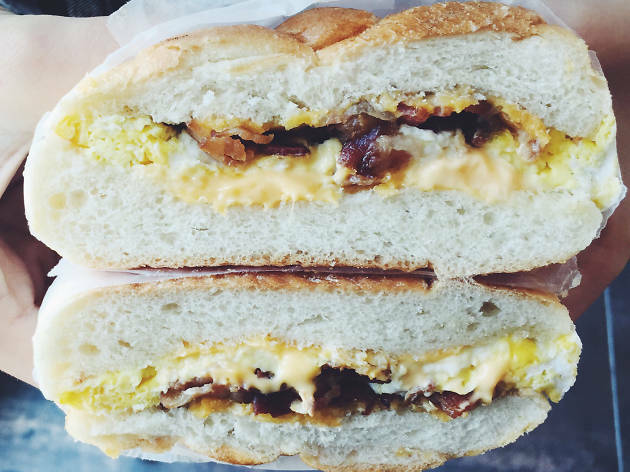 At this 24-hour corner market, find stacked sandwich classics (chicken club, Italian sub) and original creations like the teriyaki-and-hot-pepper sandwich layered with creamy avocado slices, or the famous P.H.O. 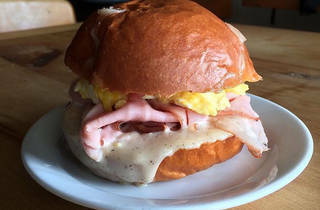 Sometimes what you want, though, is a purist BEC and for that, turn to the shop's breakfast sandwiches, simple combinations of griddled eggs, morning meats and American cheese on your choice of a roll or bagel. 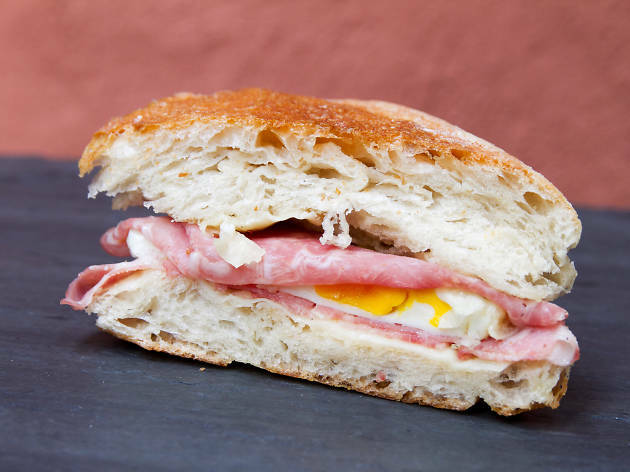 At Il Buco’s casual offshoot—one part winecentric restaurant (Vineria), one part gourmet food pantry (Alimentari)—you can find an Italian-accented breakfast sandwich with a fried egg, slices of salame rosa and nutty Fontina cheese built on a loaf of house-baked bread. 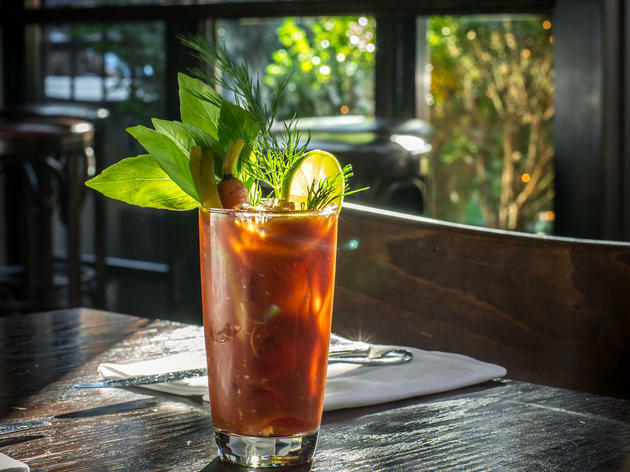 Need a hair of the dog?